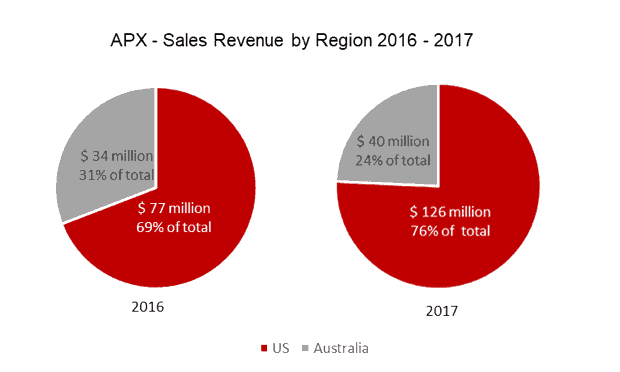 Why We Like Appen Shares (ASX APX) [New 2019 Research] | MF & Co.
Appen (ASX APX) is a global leader in developing high-quality, human-annotated datasets for machine learning and artificial intelligence. With over 20 years’ experience, expertise in more than 180 languages, and access to a crowd of over 1 million people, Appen partners with leading technology companies and government agencies to enhance their machine-learning-based products. Over the last three years, Appen shares outperformed S&P/ASX 200 Information Technology Sector Index and S&P 500 Information Technology Index by over 750%. APX reported average revenue growth of 40% FY15-17, and revenue grew more than 100% in FY18. Appen is one of the top shares to buy for 2019. Appen is viewed as a workforce management company with high exposure to the technology sector. Appen finds “curated” workers; assigns them with the data processing projects and assures the data quality before sending the processed data to its clients, who are mostly technology leaders like Google, Apple and Microsoft. Data with a human touch. Appen adds value by giving an additional level of human discernment to raw data. For example, to improve a search engine’s performance, Appen works with humans to rate how good each result is for a particular query. If you were searching the depth of the Grand Canyon and got two results, one from the US National Park Service and one from a local tour guide. Most people would trust the US National Park Service more, maybe because it looks more trustworthy, or maybe because the US National Park Service isn’t selling you anything (Source: Appen). Appen’s evaluators assign human preference and relevance to each query and make search results more relevant. In summary, Appen edits and enhances training data for better machine learning. Appen vs Google. Such data processing jobs done by Appen’s crowds are usually laborious, repetitive and non-innovative, such as data/query evaluation, annotation, transcription and translation. The relationship between Appen and its technology clients (Google, for example) is similar to that between a junior cook and a real chef. Junior cook deals with food, who chops vegetables, meat into eatable pieces, just like Appen prepares the data for Google to process. Then the chef (Google) puts magic (algorithms) to tomatoes, onions, spice and herbs to turn them into cuisines (better products). Content relevance vs language resources. Appen provides all sorts of data, but it mainly falls into two categories, content relevance and language resources. Content relevance data train algorithms to give users more relevant results, such as eCommerce site search, web search and social media feeds. Language resource data trains algorithms to build virtual assistants, smart home devices, call centre systems and in-car infotainment systems. Appen shares is highly exposed to, or even reliant on the development of the AI and machine learning market. The growth in AI and machine learning market, represented by the increase in capital investment and ML application, is predominantly enabled by the growth in computing power and the decline in storage cost. 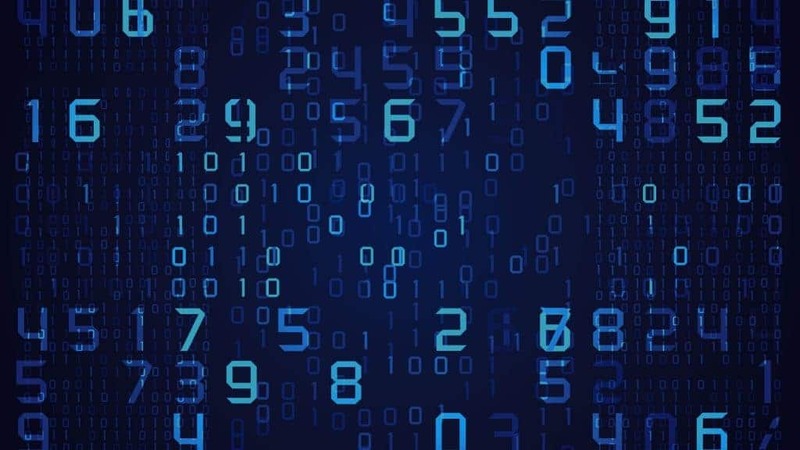 Potential threats also exist in synthetic training data and transfer learning, which would reduce the need for training data, which is the revenue source of Appen. Computer power & Storage cost. 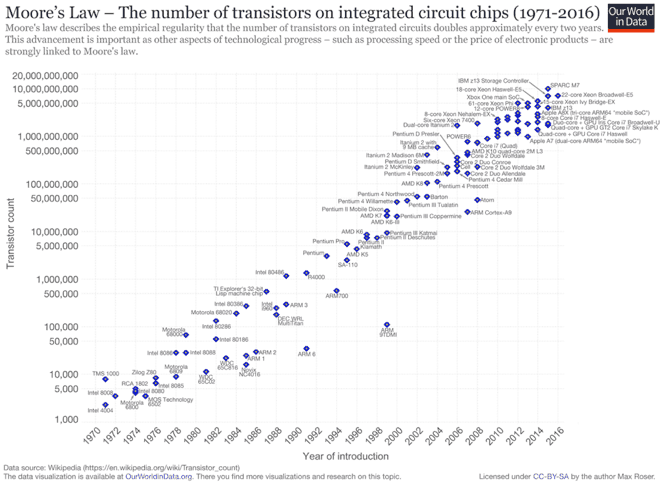 Growth in computing power and the decline in storage cost underpins the high growth in data production. 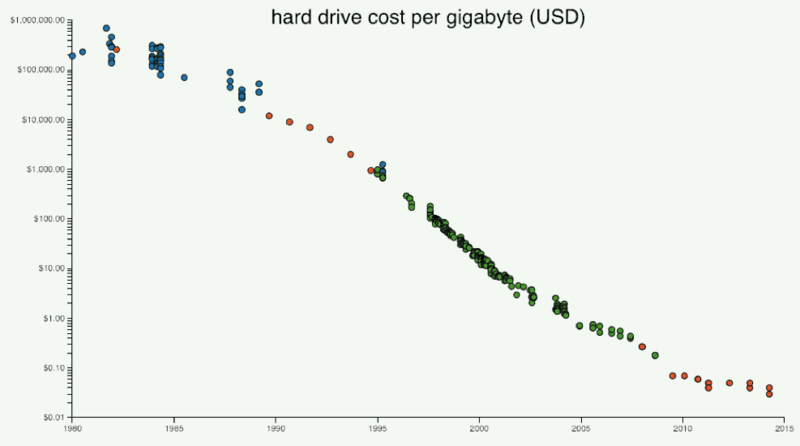 As illustrated, the most powerful supercomputer is 40x as powerful as it was 10 years ago, and the cost of storage has declined from $10/GB HDD in 2000 to $.02 HDD today. Consequently, the amount of data grows exponentially. Forbes states that 90% of the data that exist in the world was created in the past two years and Accenture predicts a 4,300% increase in annual data production by 2020. Capital Investment & ML applications. With more data, capital investments and application in the field of AI and ML starts to flourish. 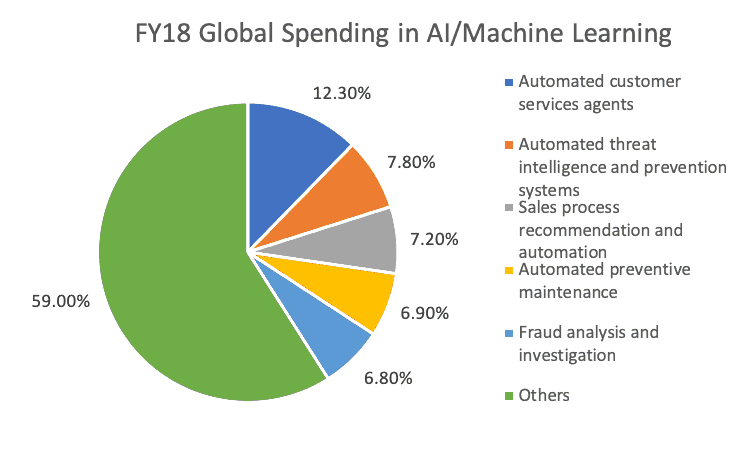 According to International Data Corporation, spending on AI and machine learning is expected to grow from $12B in FY17 to $57.6B in FY21. Deloitte Global predicts that the number of machine learning pilots and implementation will double in 2018 compared to 2017, and double again by 2020. Moreover, machine learning patents grew at 34% CAGR between 2013-2017, the third fastest growing category of all patents granted. All of these indicators imply robustness as well as potential in the field where Appen operates. Synthetic Training data & Transfer Learning. However, new technology emerges to reduce the need for training data and thus the revenue of Appen, including synthetic training data and transfer learning. Synthetic data is data that is generated algorithmically to mimic the characteristics of the real data. In other words, much less data is needed as data can be self-generating. Deloitte Consulting LLP was able to reduce the training data by 80% to build a model using synthetic data. MIT researchers also show that models they developed using synthetic alternative are just as good as those trained on real data. Transfer learning, on the other hand, provides a solution to automate unstructured content processing, and some vendors claim to cut the number of training data by several orders of magnitude for their clients. Less data, Less Revenue. Training an ML model requires up to millions of data elements and acquiring and labelling data to be used for training is both highly time-consuming and costly. Appen’s core advantage lies in its ability to provide low-cost labelled data by mobilizing a large pool of flexible workers. However, this advantage could vanish in the face of much lower data demand due to synthetic data generation as well as data process automation. Nevertheless, these technologies are yet able to handle language-related field, which is Appen’s core business, and they should not pose significant risks to Appen in the short run. Mobility of workforce & cost-effectiveness. Appen has a “crowd” of more than one million, which spans more than 130 countries and covers more than 180 languages. Appen assigns its projects online to freelancers, students globally and permits high flexibility to their working time. As the technology industry is in high dynamics, project varies and revenue is earned per project, so revenue is not very predictable. Crowdsourcing workforce thus allows Appen to scale up when more projects come in and scale down there are fewer. 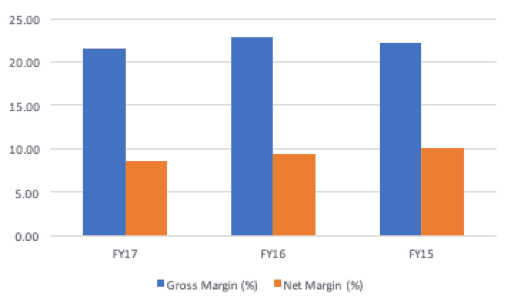 As illustrated, scalability and crowdsourcing lift Appen shares’ gross margin and net income margin over 20% and 8% consistently FY15-17. Global opportunities. 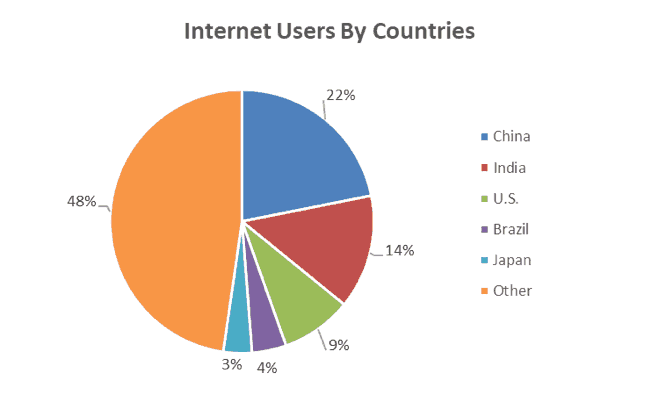 Approximately 52% of the Internet users come from the top five countries, including China, India, U.S., Japan, Brazil and Japan, while the remaining 48% comes from some 193 countries. 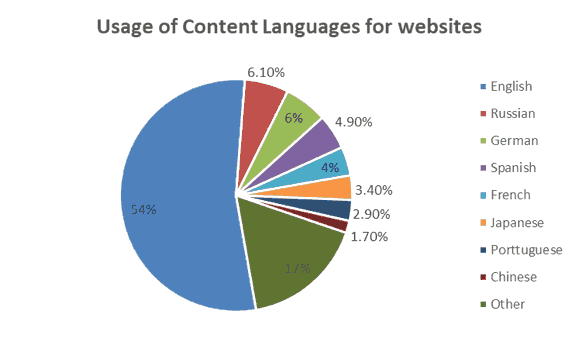 Although most of the internet users are non-English speakers, English takes up 54% of the total usage of content languages for websites. The highest gap lies in Chinese and Indian, where their population of internet users takes up 22% and 14%, while websites in Chinese and Hindi only constitute 1.7% and 0.1%, respectively. 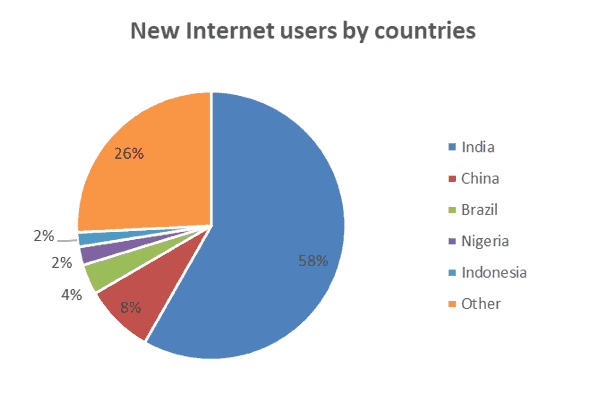 Moreover, there were 108M and 15M new Internet users coming online in China and India in FY16, which takes up 58% and 8% of total new internet users respectively. Imbalance predicts high growth. The imbalance between the number of internet user and corresponding language content in developing countries, especially China and India, could be a massive accelerator for Appen shares’ profit. When international companies seek to localize in countries such as China or India, part of Appen’s massive crowds who resides in China and India could provide valuable language resource and cultural understanding to these companies’ local business. Furthermore, as the US and China approach deal in opening China’s market, there is an unlimited potential of online content localization for Appen. Concentration of customer results in currency, customer risk and low predictability. For FY 2017, 86% of Appen shares’ revenue was derived from sales to 5 significant clients, and Microsoft and Facebook made up a total of 75%. Additionally, 76% of revenue was made in US dollars. 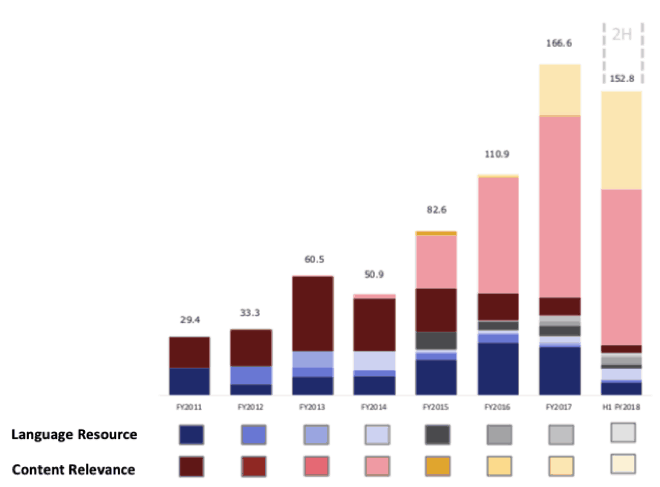 As illustrated, although Appen has been increasing the number of projects received from each client and with different data formats, and that Appen has plans to expand businesses in the medical and financial industry, Appen’s revenue in FY18 still comes primarily from one or two projects (yellow and pink as illustrated). 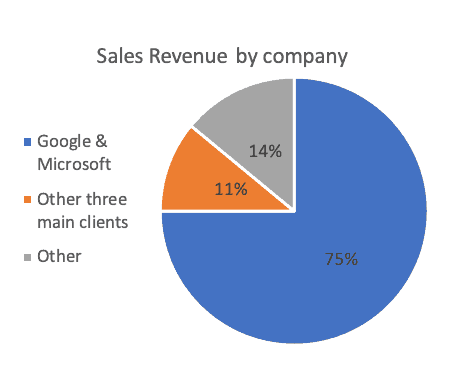 This concentration of revenue is because AI is still a niche market pioneered by few technology giants located in the US. Therefore, any loss of key customer or project, or wrong timing of projects, could significantly disrupt the earnings report. In summary, the concentration of customer/project in the US has led to high currency risk, customer risk and low predictability in revenue. Low tangibles/fixed asset on balance sheet. Due to the nature of Appen’s business, tangibles/fixed assets are expected to be low. As illustrated, after the accounting adjustment of FY18, the percentage of goodwill of total asset went down from 60% to 37.6%. 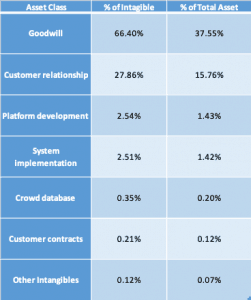 This is because part of the goodwill is recategorized as customer relationship, which takes up 15.8% of total asset in FY18. 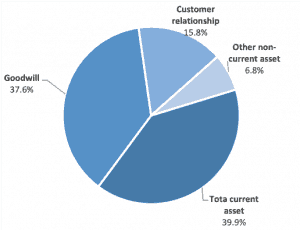 All other non-current assets take up 6.8% of the total asset. Additionally, capital investment remains low, averaging less than 3M FY15-18 and no major platform investment is expected in the short term. The balance sheet reflects the low-asset and high-labour business model, which is further demonstrated in its profit decomposition. As illustrated, that data collection (fees paid to external workers) and employee benefits (salaries paid to internal employees) takes up 64% and 13% of total revenue, respectively. Appen shares experienced high growth for three years, with revenue went up 226% FY14-17, from 51M to 166.6M. Its EBITDA grew 239% FY14-17, from 7.7M to 26.1M FY14-17. 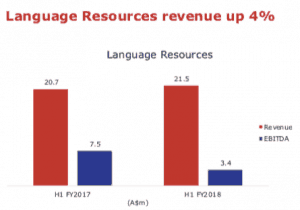 Language Resources revenue went up by 4%, impacted by a mix of work. 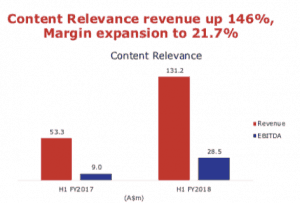 Content relevance revenue up 146% and margin expansion to 21.7%, mostly driven by Leapforce acquisition. Appen shares’ peers were screened using S&P IQ Capital based on P/E ratio and business description. Screened competitors include BrainPad Inc. (TSE:3655), User Local Inc. (TSE:3984), Change Inc. (TSE:3962). P/E ratio was selected as Appen currently sits at around 90, reflecting its high growth projection. Accordingly, P/E ratio was limited to 50-120 to select companies with a similar growth profile. Business descriptions. ‘machine learning or AI or artificial intelligence’ and ‘data’ were added to screening criteria to reflect the job done by Appen (data preparation) and the industry it is exposed to (machine learning). High Revenue & EBITDA Growth. As illustrated, Appen shares produce the highest revenue and one-year EBITDA growth among its selected peers, at 86% and 102%. 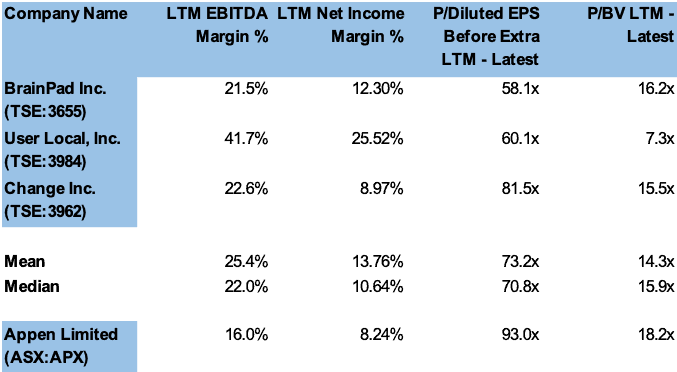 Low EBITDA and Net Income margin. Compared to its peers, Appen shares produce a significantly lower margin. Appen shares have an EBITDA and net income margin are 16% and 8.24% compared to the median of 20.5% and 12.25%. 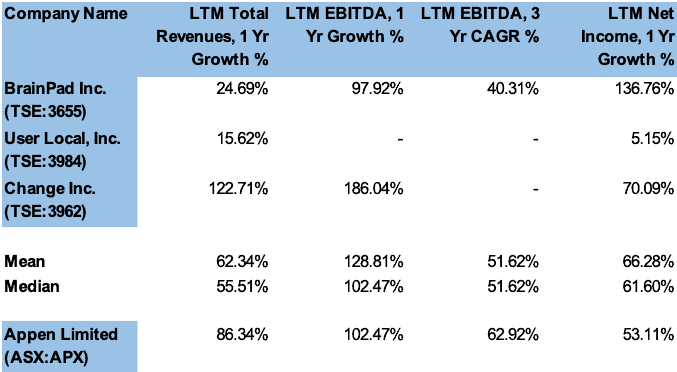 As Appen is a workforce management company compared to these ‘real IT’ companies, it is reasonable that Appen receives a lower margin. Moderate P/BV and P/E. Appen has moderate P/BV and P/E compared to its peers, with P/BV at 18.2x and P/E at 93x (as of 21.02.2019). Appen (ASX APX) is a workforce management company with high exposure to the technology sector. Through crowdsourcing, Appen develops human-annotated datasets for machine learning and artificial intelligence. As capital investment in machine learning application increases, which is driven by higher computer power and lower storage cost, there is much more demand for annotated data and thus more business for Appen. Appen’s key advantage lies in its ability to collect and annotate data at a low cost, but it also faces problems, such as customer concentration and low fixed asset. 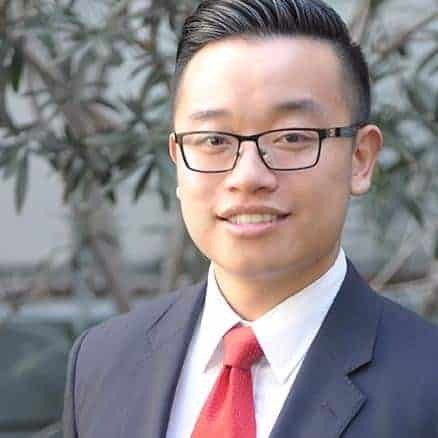 Nevertheless, Appen shares is expected to ride the next tide of big data and realize high long-term growth.